MUD SEASON... The perfect time for a sewing workshop! 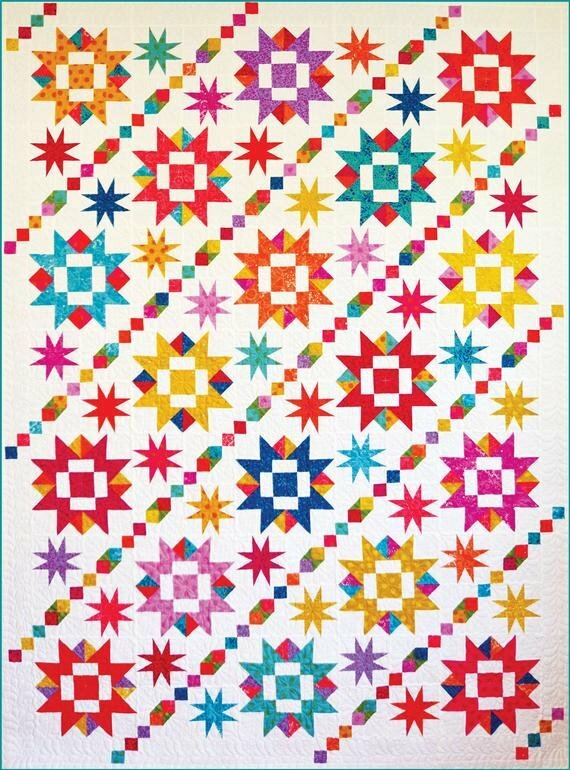 Sparkle is Michelle Renee Hiatt's latest Companion pattern for Studio 180 Modern Design. This quilt literally sparkles! Makes perfect use of Fat Quarters and is perfect on any color background with high contrast. Join Sandy, our resident Certified Studio 180 Instructor; and she will show you how easy the Studio 180 tools are to use and how perfect your units turn out... EVERY! TIME! Enjoy a weekend devoted to sewing and friendship. Times are not 'set in stone' and liable to change as time gets closer. Sandra began sewing in elementary school and, in 1992; took a class where she made her first quilt. Sandra dabbled in quilting until 2002, when she attended a weekend retreat and became hooked! She became a Certified Instructor for Deb Tucker's Studio 180 Design in 2013 and for Sue Pelland Designs in 2017. Sandra takes classes when there is something new or fun to learn, in addition to going on retreats whenever possible. She loves to pass on to students the knowledge and tips and tricks that she's acquired over the years.